www.photomacrography.net :: View topic - Measuring dioptre? Posted: Wed Apr 02, 2014 1:27 am Post subject: Measuring dioptre? If I were to "come across" (don't ask!) a close up adapter, what's the best/easiest/most accurate way of measuring its effect (i.e. focal length or dioptre) ? My present thought is to simply focus my camera at infinity, lock the focus, add the adapter, and find the new focus distance by measurement. Suggestions from the wise or knowledgeable welcomed. Sounds good to me, though if it's a very strong one your exact point of measurement in the camera/lens would introduce an uncerttainty. I had to do something similar with a supplementary lens which came on a Rodagon enlarger lens. Projecting an image of the moon onto a white van side, with help of glamorous assistant, showed that the FL was 2 metres! It's a Sigma "life size" (52mm), which is supposed to be an achromat, and I've seen stated at both 1.6 and 5 dioptre. Posted: Wed Apr 02, 2014 10:38 am Post subject: Re: Measuring dioptre? what's the best/easiest/most accurate way of measuring its effect (i.e. focal length or dioptre) ? That procedure will work fine. If you measure from the center of the adapter to an in-focus point on the subject, then the value you get will be very close to the focal length of the adapter lens. 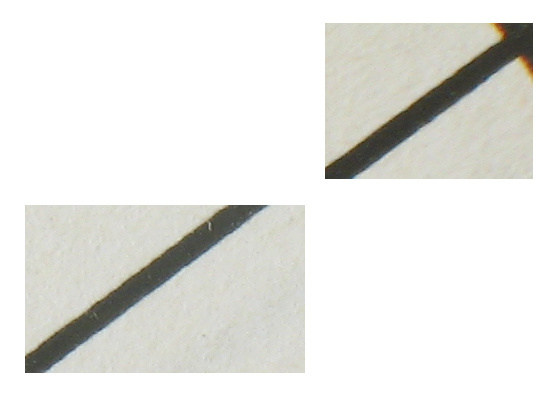 Alternatively, you can set up the adapter by itself to project a distant scene onto a piece of paper, and measure from the center of the adapter to the focused image on the paper. The result should be the same value that you got the other way. But if you're unclear about how any of this works, it may be reassuring to see two tests giving the same result. The lens/adapter has arrived; it appears to be of focal length (circa) 190mm, measure using both of the techniques described. I would welcome any advice on test technique or targets. My current favorite target is a Xerox-process paper copy of a USAF resolution chart that I downloaded from the internet and printed small on my ink-jet printer. 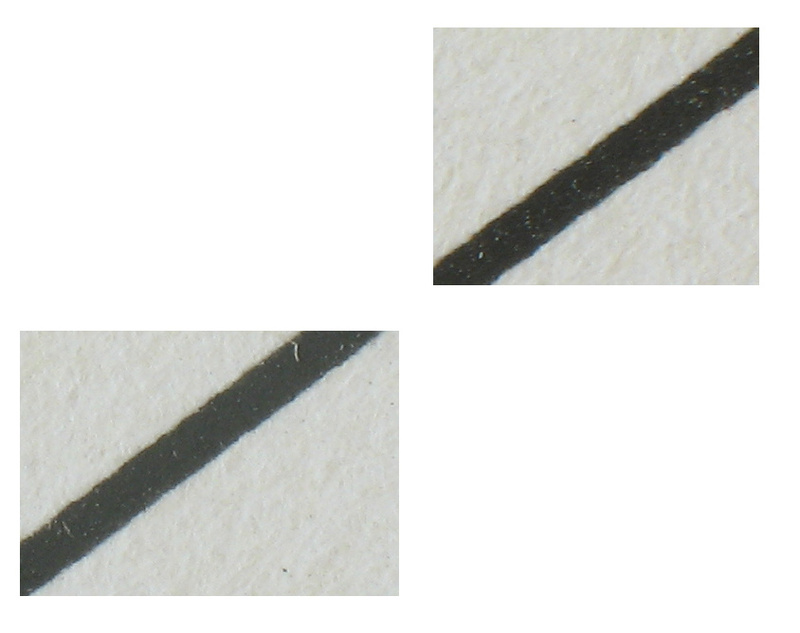 The copy has plenty of detail for evaluating sharpness even with low power microscope objectives, and the pure black-and-white nature makes it good for seeing chromatic aberration. See HERE for a sample image. The attached was taken under tungsten lights, working distance 10cm (closest possible), total field width was 1 3/8" (35mm). 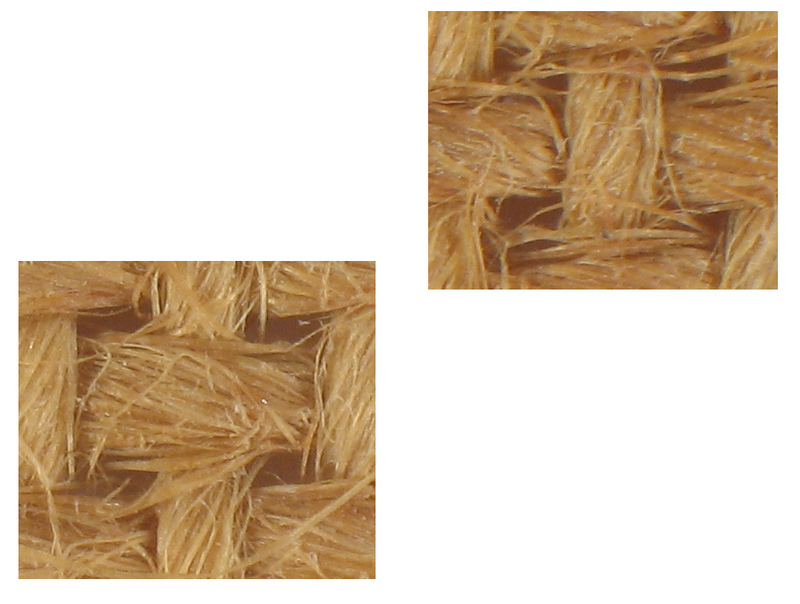 The lower left 100% crop is from the centre, the upper right was the extreme upper right of the original frame. The camera is my Canon A630, capturing 3264x2448 pixels. Following your mention about B/W fringing, I photographed a laser printed grid (I keep for making geometrically corrected shots, don't ask). Again, the shots are a 100% crop of the centre and upper right of the full image. 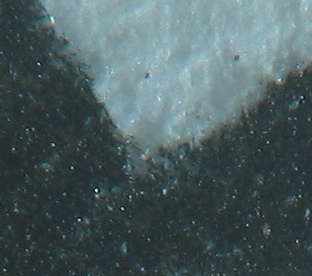 Herewith the camera's own lens, at full zoom, macro focused at its minimum distance of 24cm. And here's the same target with the Sigma, again at minimum distance (10cm). Looks like the Sigma, by placing the image in the centre of the "main" lens actually IMPROVES matters, which is happy surprise to me. Here's the closest shot I can take of the target, centre cropped. 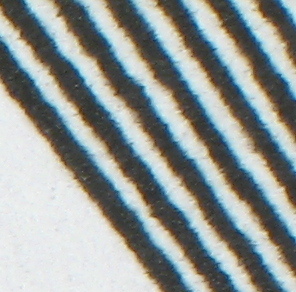 The adapter in this case is a cheap "Topman MC" f2.8, 28mm prime lens, reversed, with the camera again at full zoom, close focused, working distance around 4cm. Vignetting is extreme, hence the centre cropped sample. The corners aren't blurred, they're black. EDIT; sorry, should have said, aperture of the camera's own lens was at f8 (the minimum) for all shots. I agree about the improvement. I don't think the explanation works, though. The rear lens is doing what it always does, projecting a certain range of angles of light rays to cover the sensor. Over that range of angles, the rear lens will contribute the same CA that it does without the auxiliary lens. What's happening, I think, is that the auxiliary lens also has CA, but with the opposite sign so that the two CA's nicely cancel out. Sometimes you get lucky! I'm getting some blue fringing, but no orange on the other side, which I find a little surprising. I can see an orange fringing in your picture, although not as strong as the blue one.